Providing affordable, quality software solutions to small businesses. 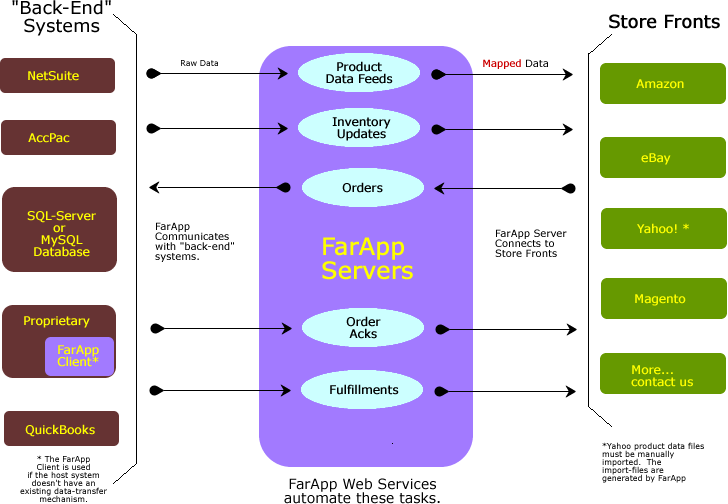 FarApp Web Services offer an automated hub to integrate your e-commerce systems to your central business system. Whether you keep your business data in a spreadsheet or on a mainframe, FarApp services can link your customer-facing systems (Web Site(s), Amazon, eBay, Yahoo, etc. ), distribution and supply-chain system (such as VendorNet), and your "back-end" systems (such as NetSuite, AccPac or QuickBooks, or proprietary software), all with very little effort on your part. Designed to run in a "hands-off" mode, FarApp Services will take the automation of your systems as far as possible. In today's world of multiple electronic channels for product sales and distribution, it is often very time-consuming to keep your product data synchronized between all of your eCommerce storefronts. Updates for inventory changes can be labor intensive, and even something as simple as catalog-wide price changes can be a large task when you consider the numerous sites and databases that need to be updated. FarApp frees you from that additional effort by extending the reach of your existing software to your eCommerce storefronts. Most systems offer some integration to your master data, but they are mainly geared to the requirements of the site itself, not to the format or requirements you have for your in-house data. FarApp allows data-mapping configurations for each of your storefronts, and automates the transfer of product-data (both new listings and updates) between all systems, allowing you to keep your master data centralized. Part of the "magic" of the FarApp services is that, unlike "canned" solutions, we recognize that your situation is unique, and are committed to customizing a solution that fits your needs. Our customization efforts are included in our standard subscription fee, so you aren't faced with the usual high cost of a custom-developed software application. To see what FarApp can do for you, you may subscribe with no risk. Your subscription will allow you to set up your basic options, and enables us to set up and configure your account. Once you've subscribed and activated your account, we will contact you to tailor the configuration to your requirements. Click Subscribe Now to try a no-risk subscribtion, and see what FarApp can do for you (you will not be asked for any payment information).